Adrián is an engineer with a Master in Humanistic Studies with a Focus on Ethics. He has written several essays about culture and politics, some of them having been recognized with state and national distinctions. 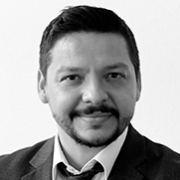 He is the creator of Politicante.mx – a specialised web portal following the performance of federal congressmen in the Mexican Federal Congress. He also participates as a regular columnist in several other portals such as Noroeste, SinEmbargo.mx and Vanguardia.mx.